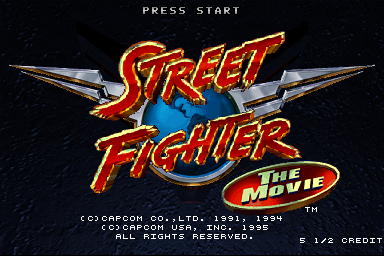 A tie-in to the 1994 live-action movie, Street Fighter: The Movie (The Arcade Game) was Capcom's attempt to compete with the popularity of Midway's Mortal Kombat series in the U.S. by outsourcing development to the makers of Time Killers and BloodStorm to make a digitized fighting game featuring the cast of the movie as fighters. The results? Well, there's a reason why this particular Street Fighter spinoff never got the Champion Edition treatment, to put it lightly. Press Down + Start + Weak Punch + Weak Kick at the same time on the character selection screen. If you input the code correctly, you'll hear a short chant. This works in one-player or Versus mode. 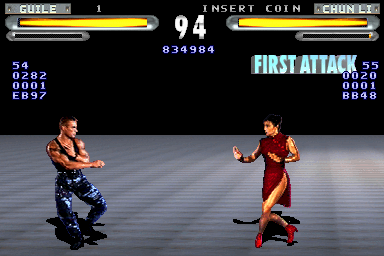 The stage (which does not display a name in the Versus screen) is a bare level with a floor against a black background, with several values shown on the screen. Center number: Unknown. Value changes rapidly when playing against the CPU, but not when playing against another player. Second number: Shows the frame ID number of the animation being played. Third number: Changes to 1 when holding back or forward, and when dropping down from a vertical or backwards jump. The number of times this room has been accessed is recorded in the audits menu as SECRET 4. Although they were created at the same time as the other characters, Blanka's digitized sprites were not used in the arcade version of the game (at least not in playable form), only appearing in the home versions released for the PlayStation and Sega Saturn. However, if you beat arcade mode with the normally-unplayable "Super Bison" by hacking the character select value to 0x11, Blanka's ending sequence will play instead of Bison's. Secret1 to Secret9: Those values change when certain "easter eggs" occur in the stages. It is currently unknown how to do all of them, though a few are documented in GameFAQs guides. Blanka Found and Blanka Fight: Blanka is not playable in the arcade game, although his ending is present (see above). However, it is possible for him to appear on the screen for a few seconds if a player wins 50 battles in a row. Doing this raises the Blanka Fight value, but Blanka Found remains unaffected. Arkane Found: Arkane is one of the secret characters and a palette swap of Blade. While Khyber can be fought by meeting certain requirements (winning the first round in the Dungeon stage with a perfect and pressing start as the platform in the middle descends), and doing so raises the Khyber Found value, it is not known if there is a way to fight Arkane. Snake Found: Unknown. There is no character named Snake in the game. FeiLong Found: Fei Long was slated to appear in the game; however, according to an interview, his sprites could not be cleaned up in time for the game's release. Fei Long does make a small cameo in the Dungeon stage if either Cammy or E. Honda are present, and making him appear raises this value. 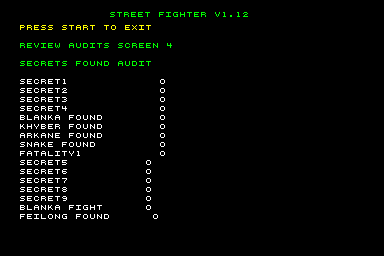 Fatality1: Being a Street Fighter game, there are no fatalities present. KOing the opponent with a Super Combo (the closest the game has to fatalities) does not change this value. The Japanese version is the only one to show the bonus points scored after a round is over. Other versions simply skip to the next round or fight. It does have its issues, however. 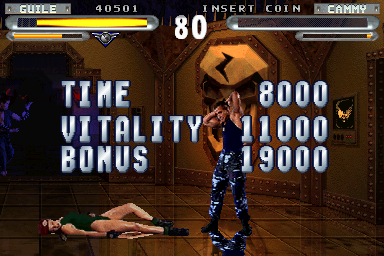 For example, this appears even when the player loses a round, and you do get points for it, and the points that you get sometimes may be based off of the CPU's stats. Another thing is that, upon using a continue, this screen disappears entirely. Balrog, Vega, Bison and Akuma kept their international names in the Japanese release, as they did in the Japanese dub of the movie (likely done due to the fact that M. Bison's name appears printed on-screen numerous times). The Japanese instruction cards use both names for each character, printing their original Japanese names in parentheses next to the international names used in-game for the benefit of players unaware of the name changes. This page was last modified on 18 June 2017, at 16:24.